In between tours, burgeoning Portland indie songwriter, MAITA has quietly chipped away at her debut full length, recorded in part at the Ok Theatre in Enterprise, Oregon, and in Portland (to be released in 2019). MAITA’s 2018 Tiny Desk contest entry was featured on NPR. 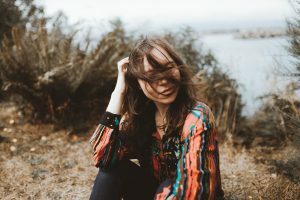 The album sees MAITA expanding upon her previous indie-folk sound, taking up the electric guitar. Thus far, singles off the album have been featured on Tender Loving Empire’s “Friends of Friends” compilation, Vortex’s Magazine’s annual vinyl release, and the Picklefest vinyl compilation. Following a month long tour of Europe, MAITA returned to the states to perform at Treefort in Boise, Wildwood Music Festival in Willamina, Oregon, and Modest Music Festival in Moscow, Idaho!